To someone who doesn’t work on a construction site or a manufacturing line, small things such as fasteners and other components that are used in the final making of a project or product may seem like standard necessities that don’t make much of a difference. For example, some may argue that spending time in comparing U bolt manufacturers is a waste of time. 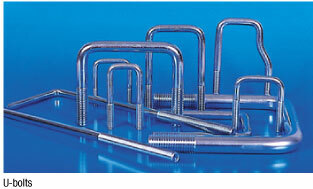 However, at R & R Engineering Co., we believe in the importance of having a choice in U bolt manufacturers, particularly when ordering custom sizes and products. Evaluating the differences in the quality of fasteners from various manufacturers will help you to understand just how important choosing the right manufacturer is. This is why we are so passionate about designing and making our products with precision and quality for our customers—holding ourselves to the highest standards in the industry. When customers order U bolts or other customized fastener products from R & R Engineering Co., they can leave with the confidence in knowing that they will receive exactly what they ordered. Unfortunately, the same cannot be said for other manufacturers in the industry as they don’t have the capabilities to ensure each part is designed to meet the sizes and specifications of their customers. This means some U bolts are going to fit big and some are not going to fit at all, leaving customers unhappy and unsatisfied. Paying poor attention to detail and not meeting a client’s needs results in misshaped or misfitting bolts that can add complications to the overall project. While it might be possible to slightly reshape the bolt to fit the pipe, conduit, or tubing—this additional time spent adjust the bolts can end up running the project behind. In addition to making sure that each of the bolts we manufacture is the exact size that was ordered, we also have a quality control process throughout our entire chain of production and operation. 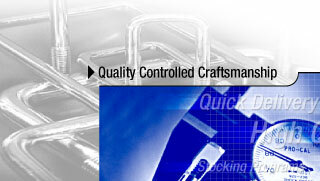 We are working towards our ISO 9002 certification, which is a set of standards that form our quality control process. By making sure our team of experts are trained and knowledgeable about our processes, including the lasted technology in automated U-bolt machines—we can produce small and large runs that exceed industry standards. One of the things that sets R & R Engineering Co. apart from other U bolt manufacturers is our ability to significantly reduce lead time and get orders to our customers quickly and efficiently. With 38 Planetary Machines, our facility has significantly more equipment and capabilities than any of our competitors. We are also the only company in the United States that has an automated U-bolt machine to handle ¾ inch custom bolts, as well as 5 machines that can produce 5/8th inch bolts. When you combine our ability to manage our own tool and die needs in-house with our production capabilities and over 30 years of experience in producing quality fasteners—R & R Engineering Co. brings an endless amount of advantages to our customers with every order.